Grambling’s wait for a win had gone on 32 games, 653 days, parts of three seasons. Then came time to host NAIA Central Baptist College in Grambling’s most winnable game of the season, and it had to wait an extra 70 minutes just to get started. The refs were late, another whoopie cushion from the cosmos. Here, Grambling, have a seat. Got a nice, comfy chair for you right here. Alas, the game eventually did start, and was close in the middle, but ended with an 83-75 Grambling win, meaning the Tigers have gotten off the hook without making history. The Div. I record for consecutive losses is 41 by Towson. The longest active losing streak in Div. I now belongs to Cornell, which has lost 16 in a row and is the only team still winless this season. Until Monday, Grambling (1-4) had lost 25 nonconference games in a row, the result of financial realities that force the basketball team to play unwinnable road games in exchange for paychecks that help fund the rest of athletic department. The Tigers didn’t play a nonconference game at home last season, when they went 0-28 with a roster that included just four scholarship players. Grambling is suffering from NCAA Academic Progress Rate penalties that reduce its scholarships, practice time and make the Tigers ineligible for the postseason. But this is a new year and a new team. Seriously. Only two players return from last year, and Grambling has 10 players on scholarship now. The Tigers even think they can be competitive in the SWAC. Nonetheless, coach Joseph Price said Grambling put together this year’s schedule with an eye toward keeping that streak number as low as possible. Monday’s win was only Grambling’s fifth game of the year, and the Tigers scheduled it late, putting themselves in the rare position of cutting the check, rather than cashing it. Central Baptist (1-10) gets a lot of calls from teams in that situation. The only school it has beaten this year has an undergraduate enrollment of less than 200, if that gives you an idea how far down the barrel Grambling had to scrape for this one. The guarantee was small, a couple thousand bucks or so, but CBC took the game. And it took Grambling a little more than even the Tigers could have expected. At halftime, Central Baptist was shooting 65 percent and trailing by just two. Midway through the second half, Grambling made one little run to get up by double digits, and that’s all it took. Tipoff on Monday was scheduled for 7:30 p.m., but when the appointed time arrived, the referees hadn’t. Seventy minutes later, they had two of the three referees that were supposed to be there, and decided to get on with it. Central Baptist scored the game’s first basket and shot 58 percent from the field, but committed 25 turnovers and never led by more than two. 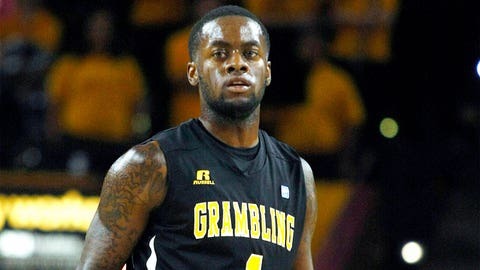 A’tori Shine had 27 points, six assists and five steals for Grambling. Believe it or not, Grambling has a chance to get (relatively) hot. It plays TCU Thursday in Fort Worth, but returns home again Dec. 21 to host NAIA Lyon College.